–The new series Free! gives an image completely different than what Kyoto Animation has previously done. Would you mind telling us how you came to participate in this project? Utsumi: To start, I was asked if I wanted to make High Speed!, one of the Encouragement award winners in the second Kyoto Animation Award, into an anime by the producers. The manuscript itself focused on elementary school boys, but there hasn’t been many anime titles focusing on boy leads as of late. It was a very entertaining story, so I really wanted to turn it into an anime. –As you said, High Speed! detailed the elementary days of the main characters. Why did you decide to age them to high schoolers when making the anime series? Utsumi: The original story focused on elementary schoolers; it would have been very difficult to make an impression animating those specific characters. Furthermore, it was difficult to see what kind of stories you could tell with that age group. We wanted to go along with the themes of the source material as well as finish the tale of the swimming team, so we aged the characters and set them in a swimming team in high school. Since I was in a swimming team during my high school days, I could use my experience in the story and whittle it down as we needed to. Also, I had a really strong desire to draw the muscles they would’ve developed by high school. –When did you compete in swimming races and could you tell us about how that helped detail portions of the series? Utsumi: I swam all three years of high school. I’ve loved the water since I was little, but I wasn’t in environments where I could swim as my elementary and middle schools didn’t have a team. As I entered high school, I had finally reached a school that had a team, so I swam continuously for all three years. There were a lot of very good kids there, so I know quite well how Rei feels seeing talented swimmers. (laughs) I wanted the anime to detail my previous experiences in the water on the screen: how it felt, what good feelings it brought, etc. I wanted to produce something where people watching would begin to think how good it felt to swim. 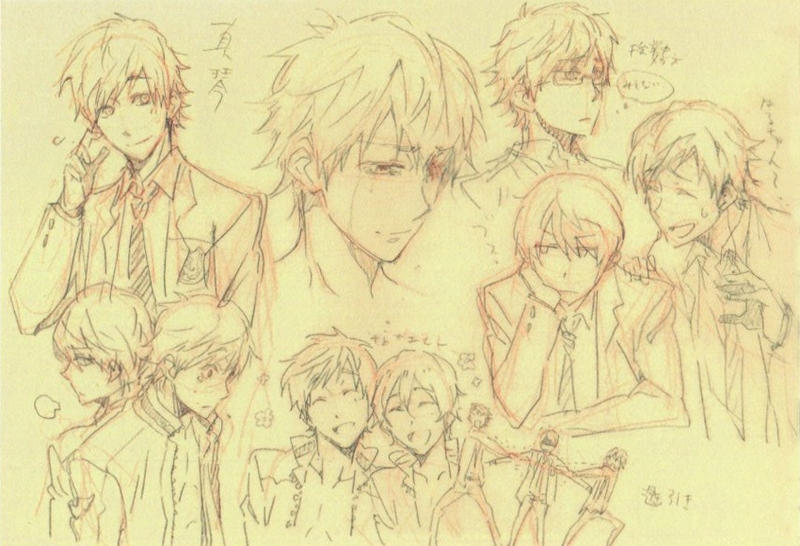 This is an illustration drawn by director Utsumi which was posted on Animation Do’s home page. From left to right is Kaede, Nagisa, Haruka, and Makoto. The character in the background is Rin. –What are the themes this show revolves around? Utsumi: Water, friendship, bonds, and upper bodies! Regardless of genre, there’s so few series that involve swimming, so I’ve wanted to make a boys swimming story for so long. Excluding water, this series’s biggest selling points are friendship and bonds. Once you add water and upper bodies, there’s no other big points to mention. –Utsumi-san, you seem to have an obsession with upper bodies as a director. Would you talk to us about that? –Nishiya-san was chosen to be the character designer for this show. Was there a particular story behind his selection? Utsumi: Nishiya-san was chosen from the very beginning. Everyone was in agreement. (laughs) Nishiya-san is the authority when it comes to male characters among our staff. Nishiya: There’s not really been an opportunity to draw muscles until now…. Utsumi: When I had the opportunity to see Nishiya-san draw muscles, I fell in love with his work. Besides that, he was able to break down my various instructions and adapt them into the way he drew. There was no one else but him! And also his way of depicting how the swimsuits go around the hip area was superb. Utsumi: We had originally decided to have a guy draw the guys. I knew we would be able to grow accustomed to drawing his style, so I asked him to lead us astray. –Nishiya-san also thought about how they would dress casually, didn’t he? Utsumi: Definitely pay attention to Nishiya-san’s fashion sense. He thoroughly researched with many magazines so that his characters would look in-style. Nishiya: They can’t look unfashionable after all….. It’s especially difficult for anime characters as well. Whatever looks nice in a magazine may not fit on a character. You always have to think about how it would appear on the character when you’re drawing them. –So you entrusted the casual clothing for Haruka and the rest of the cast to Nishiya-san? Utsumi: While I wouldn’t hand the main 5 over to him, I did roughly request he work on it. I interjected a little bit with opinions. Nishiya: This time my goal was to frantically do my best to live up to what the director wished for. –What was it that she wished for? Nishiya: She wanted to detail the tautness of the bodies… Up until now, we’ve always drawn about 6 head-lengths for the body, but we altered it to seven for this series. Once I thought of it and tried drawing it, I personally felt that we could bring out the masculinity of the characters. Utsumi: For me, I worried that the presentation of the faces would become distorted. Like if we put a hand in front of the face, we need to communicate that it’s a hand in close-ups. Rei wears glasses, so when he fixes their position, I wanted to show that his hand would be so big it’d cover both the glasses and part of his face. We also emphasized the bone structures. Their frames have to be masculine and powerful. Knowing a lot about the beauty of the skeletal system, your conversations about things like how the ribs curve and such never end. You’re never letting those details about the curves or the muscles slip away! Nishiya: For me it was how their chins hang from their heads. With how big heads are, it feels like the chins are tucked underneath them. Same for the chests too. Utsumi: Sometimes when looking over what we’ve drawn, I wonder if we’ve gone too far; it never feels like we’re completed. Reality is so amazing. Foreign athletes have such a strong hip bone too. This was the first character image drawn by director Utsumi. This is Haruka, the protagonist. This image was carried by the director as the base for each character’s design. –So then, introduce us to the main characters please. Let’s start with Haruka, the protagonist. Utsumi: Haruka in one word is “cool.” Haruka seems to be equipped with “cool”ness. One aspect of him is his love for water. He has a bit of an eccentric image; he has trouble interacting with people at a fundamental level. If he’s not interested in something, he won’t do it. Normally his facial expression is very unsociable, but he gets highly emotional when it comes to water. He’s a direct boy who has a strong obsession with the freedom that water gives him. I think the audience will get to see Haruka’s unshakenness gradually change as he matures throughout the series. Nishiya: When thinking about Haruka, the first thing that comes to mind is his eyes. Utsumi: He has a peculiar strength in his gaze that attracts people. –Were there any troubles when designing Haruka? Nishiya: Once we had the base visual image, there were no difficulties with him. Utsumi: Haruka was the foundation we built the other characters on. Nishiya: We ensure that his body had just enough muscle on it to feel stylish. Utsumi: His eyes were made blue to reflect his love of water. Nishiya: We ensured that his eyes shone through his hair in order for his eyes to show his emotions throughout the series. Even if the hair was in front of the eyes, you would still be able to see his expression. Utsumi: We made sure that there were a lot of detail packed in the eyes when we drew a close-up of his face. We considered basing this on using a lot of frames for the close-ups. –Please tell us about Haruka’s habits and his clothing. Utsumi: Haruka is lightly dressed because when he sees water, he wants to swim in it. He only wears the shirt for his uniform so that he can instantly go into the water when he takes it off. Similarly, his jacket is also unfastened in the front for easy removal. Nishiya: Actually, we designed the swimsuit models first for the characters. Then when we put the uniforms on each of them, everyone’s matched but Haruka’s! Utsumi: We were shocked. The mismatched sense it gave to us was incredible. 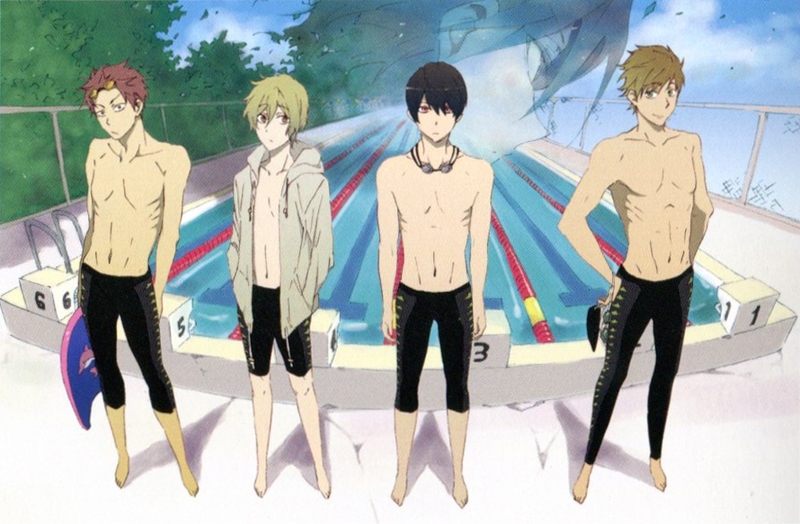 We wondered if everyone else looked this mismatched, but it fit everyone but Haruka…. Actually, this doesn’t mean that Haruka is always wearing his swimsuit! There’s the problems it would bring up in daily life or shall we say how moldy it would become…. (laughs) He only wears it whenever there’s a sign water will appear. Call it natural intuition. –I’ve heard that Haruka’s personality referred to as a “waterdere.” Could you please tell us what that is referring to? Utsumi: Haruka’s a human, so of course there’s things and times that make his heart flutter. We call him a “waterdere” because it’s difficult for his face to express those heart-fluttering emotions, but water brings out his true emotions onto his face. Since he loves water, this was a necessary component of his character for us. Up until the current time, Haruka is someone who’s difficult to approach, but we questioned if this side of him would make him appear cuter to others. Sometimes it’s just obvious he loves water by how much his eyes sparkle when seeing it. Those kinds of actions and glances speak as much as words to help bring out that humanity in him. 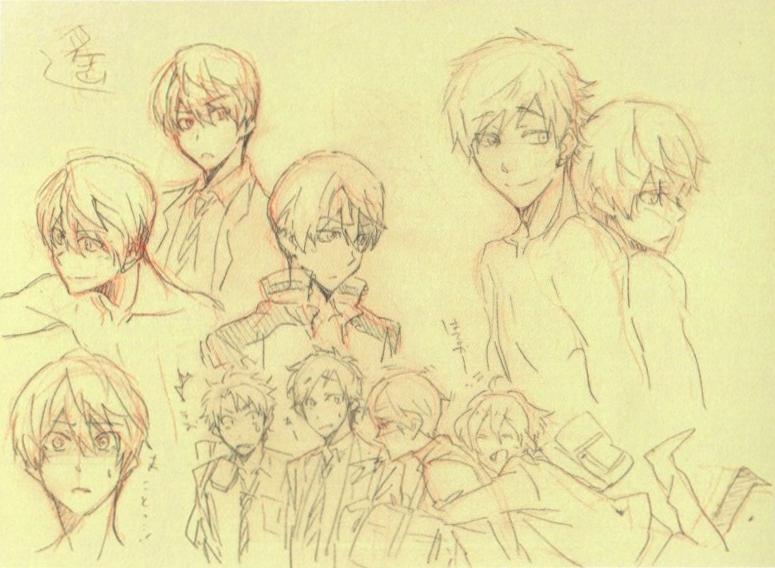 Makoto’s rough images. Various images like “wears glasses in class” were created. –Continuing onward, please tell us a little about Makoto. Utsumi: In one phrase, he’s a sweet boy. The impression hasn’t changed since I read the novel. He’s your everyday common high school boy. Strong, sweet, and a very helpful older brother. He was childhood friends with Haruka, so there’s not anything he hates about him. Conversely, he knows quite well the things he likes about Haruka. And because of that, he knows how to handle Haruka very well. Since Haruka isn’t the type to talk much, Makoto will follow up for Haruka and speak in his place. If Haruka wasn’t like that to begin with, Makoto wouldn’t become close to him. Since he is flawed, Makoto’s there by his side. I wonder if Haruka would also notice if Makoto’s big existence wasn’t always taking care of him. Actually, one point of Makoto’s character is that he’s scared easily. He’s big, yet scary things get to him. It was a bit sad when we decided to make him scared easily yet have that body style. My impression is that as he grew bigger, he didn’t know how to use his size to his advantage. Really, a smaller body seems to fit that side of him. Nishiya: One aspect of his design are his drooping eyes and eyebrows. Having both droop give him a softer expression. And of course his body has to have big dimensions. Utsumi: Balancing the size of his face was also very important. Since Makoto is tall, his skeleton itself is oversized. So, we were aware his face would appear slender in comparison. I also got the impression he would wear his pants around his hips like today’s male high school students do. If we made a mistake, then people would say he had short legs, so Nishiya-san skillfully drew the pants just slightly lower. Utsumi: Makoto’s standing pose where he crosses his arms is meant to confer that he’s keeping watch over you. It’s a post Nagisa would never do. Nishiya: Makoto’s nape is a bit long. Actually if that nape wasn’t there, it would be hard to know that it is Makoto. If the nape is hidden, you understand it’s not him. Utsumi: Makoto’s image color is green. It gives off the kind of atmosphere you feel in a gentle characters. 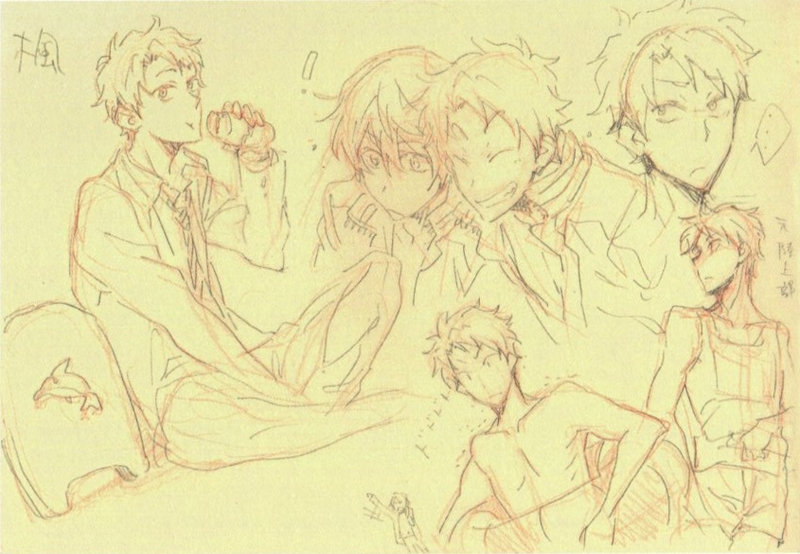 Nagisa’s rough images. There’s a portion that is different than the atmosphere decided upon for him. –Next, please tell us about Nagisa. Utsumi: Nagisa’s the cute younger brother type of character. He always acts childish for his age, even though he’s not even a year younger than the rest of the group. Nagisa is the only one who physically plays around with Rei, but since it’s Nagisa, Rei’s good points are brought out. He’s the one who’s able to bring out everyone’s various expressions. His outer appearance also feels childish with his big and round hairstyle. His personality is a natural airhead; everything goes over his head. He’s the type of person who gets by on instinct. As soon as he thinks of something, he acts on it instantly. His character is very important to help move the story along. –Are there any points the audience should pay attention to regarding Nagisa? Utsumi: Nagisa has a lot of small penguin accessories because he loves big penguins. In the first episode, you’ll get a glimpse of his underwear which have penguins on it. Definitely check the frame! (laughs) Of course he enrolled in Iwatobi High School wanting to swim again with Haruka and Makoto…. but there was actually another reason. Iwatobi High School…. Iwatobi… means rockhopper penguin. With that kind of inspiration, he easily made his decision where to apply. Nishiya: He’s a cute character, but as a first year high schooler, his body is a bit tense. He’s not just cute and, while he does say some stupid things as he pleases, he’s not an idiot. We drew him carefully while examining the rest of the cast to maintain balance among designs. Utsumi: Also, Nagisa’s uniform is slightly too big for him. Nishiya: However, at times he does act a bit more delicate to give the impression he’s a first year. –Please tell us about the differences between the rough design of Nagisa and the current design. Utsumi: Originally he was supposed to be a cool and somewhat stand-offish character, but as I was thinking of ways to convey the novel’s atmosphere on TV I settled on what you see now. As for why he would become cool and stand-offish when he was very childish in the past, he had admired Haruka then and so perhaps he would’ve set his goal to act like Haruka in the future. However, Nagisa not changing is very Nagisa-like. He’s the important mood-maker of the group. And so I ordered Nishiya-san to depict him very childishly. When I first thought about anime original characters, I created Kaede. Rei inherited his track-and-field team setting. –Please tell us about Rei, the person who joins the swimming club mid-way. Utsumi: Rei initially feels cool like Haruka does, but as soon as he opens his mouth and starts to frolic, that similarity ends immediately. He’s the type of person girls would complain “he looks so cool, but it’s such a shame he had to open his mouth…” (laughs) He’s a quibbler in the theory side of things, but I can say he has a problem in the heart of things. He loves beautiful things, so his appreciation of beauty is very high. His face immediately expresses whatever he feels, so he’s easy to read. –In the early stages, Rei wasn’t present. Instead there was another character called Kaede. Could you please tell us how you came to create Rei? Utsumi: I was thinking about original characters even before series composer Yokotani-san was included. The first character I thought of was different than Rei; he was an more idiotic character named Kaede (a redheaded boy in the early color illustrations). He was close to what Nagisa is now, the fun, somewhat stupid boy who’s easy to get along with that you always see in a boys’ high school. Though I felt I explained it in the rough draft stages, I felt his connection with Haruka wouldn’t need to be spoken. As he was originally on the track and field team, he would be a beginner in the swimming team. He couldn’t keep up with the rest of the team during their practices and it’d take Haruka and the others to help him overcome his handicap. At that moment, the viewers would begin to bond with him on his interest in swimming and feel some empathy for him as he continued to practice. He’d be somewhat of a entertaining “how to swim” book. If we were successful, people would begin to empathize with him as they watched. He was given short hair because I wanted at least one person to have it. Nishiya: Some of his characteristics are still present in the minor characters. Utsumi: Since he would have a keen appreciation of beauty, I thought of a sound that would be pretty and thus changed his name to Rei. Nishiya: Rei was the character I had the most difficulty designing. I was very troubled trying to find a hairstyle that matched his glasses. I tried everything from monk to long haired. Utsumi: It was really difficult, wasn’t it…. I had also thought about long hair, but boys who are serious about sports tend to prefer shorter hair. Nishiya: And then he couldn’t act like the other characters. Utsumi: His characteristic is his forehead. Rin is also a forehead character. Sometimes when looking over Haruka’s team I wanted to plan some differences between them. Since he’s a character who loves beauty, I thought he should have an obsession with keeping his bangs trimmed. Every morning he trims them and makes sure the angles are correct. Nishiya: He’ll make sure the lengths of both sides match his peculiar sense of beauty. 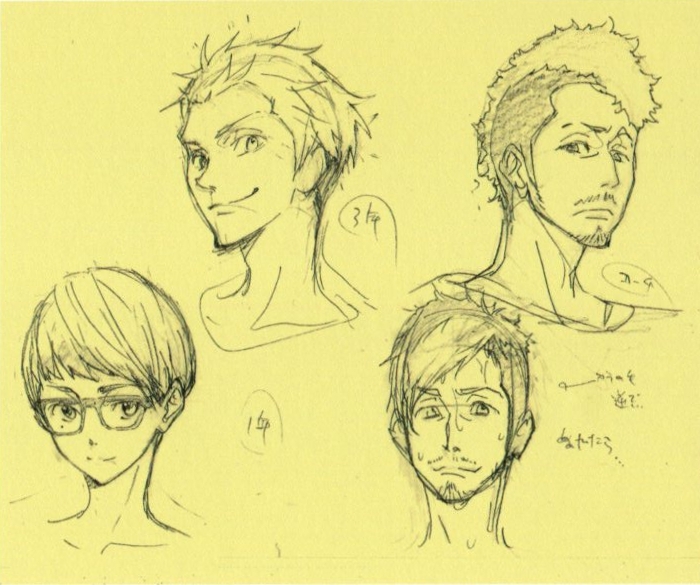 Utsumi: I had wanted to make him have close-cropped hair, but that style of hair was a disappointment when we drew it. So, accordingly, we made ensuring the lines of his head were beautiful a priority when drawing him. Nishiya: Since he wears glasses, we had to ensure his eyes weren’t too big either. 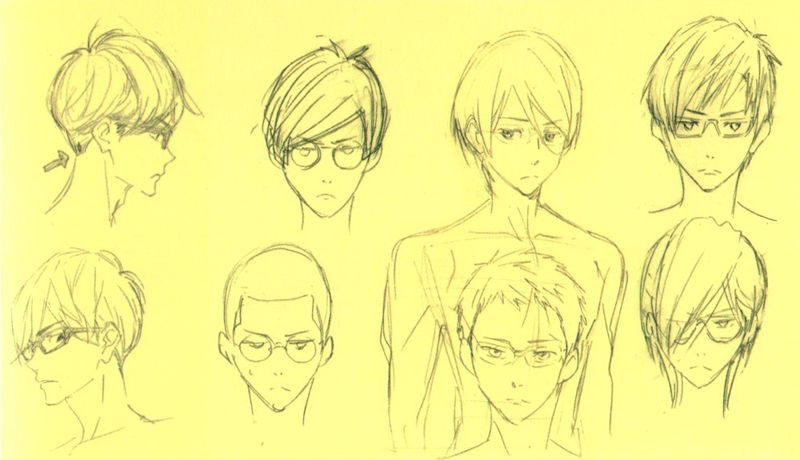 Utsumi: When Rei swims, he’s supposed to take off his glasses. However everyone would become incoherent to him. Our plan to overcome that was to depict everyone’s faces clearly whenever he took off his glasses in the anime since he only needs them slightly. Rei’s eyesight is about 0.4-0.3. He doesn’t need glasses, but he doesn’t like it when everything gets blurred, wouldn’t he? This is another quirk of his beauty sense. Nishiya: It was a relief not to have a lot of things revolving around that. Utsumi: As an original character, Rei was exceedingly difficult. We had a lot of help given to us in creating him. These are Nishiya’s rough drafts of a couple of the characters who inherited Kaede’s atmosphere. On the right is Sasabe and on the left is Nitori. Utsumi: His sense of beauty overdoes it to the point where he always tucks his shirt in. (laughs) Look closely and you’ll see he does everything properly, even ensuring the straps on his backpack are perfectly tight around his uniform. As for his casual clothing…. ?! That’s beyond what we’ve contemplated. After this, we’ll plan to discuss it….! 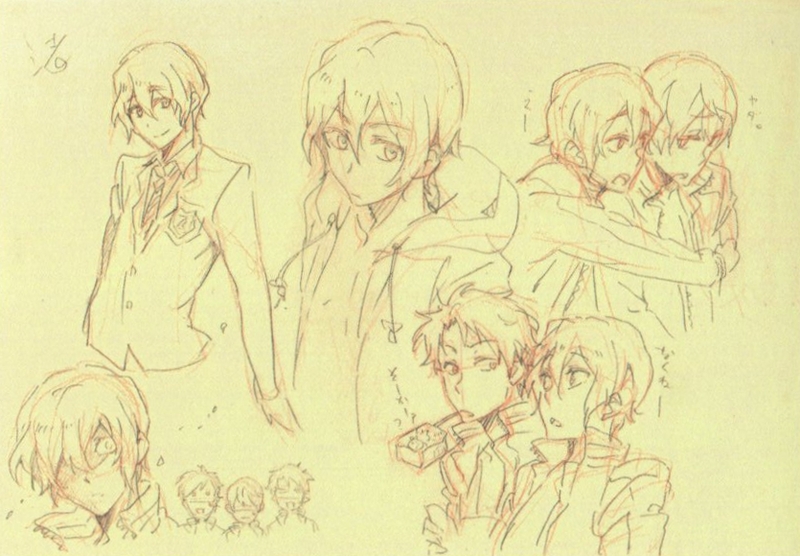 These are rough images of Nishiya’s attempts of Rei’s hairstyle. Among the various hairstyles he drew are the close-cropped style and the arrowhead. This is it for part 1 of the interview. CLICK HERE for part two, which delves into Rin, elementary school era designs, Gou, Amakata-sensei, and more! This entry was posted in FREE!, Kyoto Animation, Translations and tagged animation, free!, interview, kyoto, new show, nishiya, Translation, utsumi. Bookmark the permalink. So many good lines and good insight to their characters (Haruka in one word is “cool.”). I had never thought about Haruka’s eyes and their color reflecting his water love and being waterdere and etc. Nagisa’s was enlightening too and finally answered questions I had when first seeing the image sketches. Lastly the discussion on the clothing choices and style for Haruka and the rest. Have to say they did good research in that regard as Ive been rather impressed with outfits chosen. I wonder if similar was going on in their choices for how to populate the characters rooms in episodes (Nagisa’s for example). On that note did remind me of the attention to detail give in Tamako Markets Mochizou’s room and Hyouka’s Satoshi Fukube room. Most design choices are very similar to this. I love writing out these types of interviews because we get to see just how much thought goes into each frame of animation with the designs and backgrounds. It’s amazing to think how so many different people unite in ideas/expression to create one cut/episode/series. Changed. Thanks for the assistance! Pingback: Latvijas anime blogs » Free!